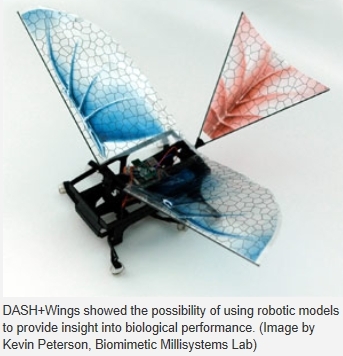 BERKELEY — When engineers at the University of California, Berkeley, outfitted a six-legged robotic bug with wings in an effort to improve its mobility, they unexpectedly shed some light on the evolution of flight. The research team, led by Ron Fearing, professor of electrical engineering and head of the Biomimetic Millisystems Lab at UC Berkeley, reports its conclusions online Tuesday, Oct. 18, in the peer-reviewed journal Bioinspiration and Biomimetics. The National Science Foundation’s Center of Integrated Nanomechanical Systems and the U.S. Army Research Laboratory helped support this research.